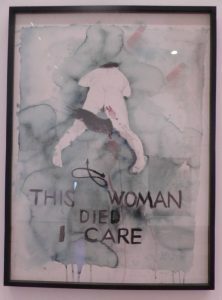 I had a look at the Feminist Art Exhibition, on at the Auckland Art Gallery. It is showing until Sunday 16th June 2018. I was quite surprised that the painting that I thought had the most “feminist” punch, was not in the Feminist Collection. It is in the Main Collection, nearer to the entrance. Note: I have made no comment on the quality of the materials displayed. Best that you make up your own mind. It brought back many recollections going back years (I am awfully old). Then I wondered, are there any similar collections, recording the herstory of the Men’s Movement? There are, but they are somewhat scattered and as far as I know, not well linked together. I have a collection of photos and video from protests through the years. I am keen that we don’t let these types of material slip through our fingers, as the years go by. It is also possible that more active use could be made of them? Anybody with relevant collections that they are willing to share with others, please comment or contact me privately. I do recall a prevalence of Feminist exhibitions when Clark as PM was also Minister for the Arts. And also some strange funding decisions like the $100,000.00 statue of a toilet. Who is the current Minister? I’m not an art critic by any stretch of the imagination, but I am wondering from the art perspective whether that picture would be viewed from the point of view that it did not have its own integrity as a story or a message and simply that it was a reflection of the artists own weakness and insecurity. And deciding where it is positioned is a reflection of a gallery manager’s thinking. If you wanted a more discerning answer to those questions perhaps have a chat to Hamish Keith, who has an extensive history both in art and as an unclosseted feminist.